FlexShares exchange traded funds are designed to help institutional investors target their specific objectives. A pension plan sponsor may seek to manage inflation risk for plan participants while an insurance company may seek capital appreciation on surplus assets. FlexShares ETFs are “engineered” to produce persistent return attributes and serve as valuable components for portfolio construction. Our Flexible Indexing approach emphasizes transparency and cost efficiency to deliver non-traditional index strategies. We bring investors our expertise as seasoned investment professionals intensely focused on identifying and delivering unique insights not already priced into the market. Investors can benefit from our dedication to advancing the science of index design and multi-asset class solutions and the clarity and transparency we deliver through our outcome-oriented ETF solutions. Flexshares leverages the investment expertise across our equity and fixed income disciplines to design solutions to address investor needs. Each strategy purposefully targets one or more of our fundamental investment objectives: Capital Appreciation, Risk Management, Income Generation and Liquidity Management. As an ETF sponsor of choice, FlexShares leverages deep investment expertise, collaborative relationships with investing clients and a rich fiduciary culture to deliver distinctive ETFs. 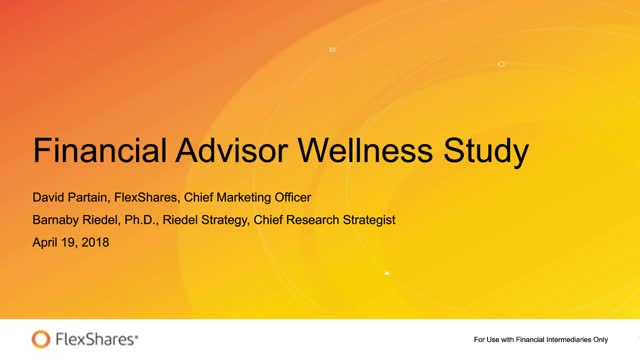 In December 2017, FlexShares ETFs engaged third-party research firm1 Riedel Strategy to conduct a national study of occupational wellness among financial advisors, to better understand the advisor experience and help advisors live better, more productive and satisfied lives. Nearly 700 people completed and returned the survey – giving us insight into the health and wellness of advisors from a range of firms across the United States. What we found, coming in the midst of a long-running period of market stability, might seem counterintuitive: Advisors are under a lot of stress. Conversely, they also are very satisfied with their occupational choice. FlexShares' Disciplined Duration MBS Index Fund offers more exposure to mortgage-backed securities. MBSD attempts to give investors mortgage-back securities (MBS) benefits while also limiting effective duration contraction and extension variability. Duration is the sensitivity of a fixed income security’s price to a change in interest rates. Historically it has been a viable alternative for individual and institutional investors to help minimize risk with MBS securities. Unlike legacy MBS products, MBSD tracks an index comprised of MBS securities from a variety of U.S. agencies. Find out how the FlexShares Morningstar US Market Factor Tilt Index suite of funds are engineered to provide deep exposure to the broad US equity market, while seeking to take advantage of the longer-term small cap and value performance advantage. SKOR and LKOR ETFs use nontraditional indices based on US corporate bond credit scores, which we believe offer a leading indicator of rating changes. To support liquidity, the indices are limited to only the most liquid issues. To identify quality, the indices focus on the metrics we believe matter most in fixed income: management efficiency, profitability and solvency. Learn how we are investing in companies that are making a positive impact on the environment, social issues, and governance while exhibiting positive risk versus return. Learn about two new ESG-based ETFs from FlexShares that is designed to give investors the ability to put their money where their values are. Why sacrifice potential returns in your core portfolio in order to make sustainability a key part of your investments?